Sprout Space keeps children’s health and their various learning styles in mind. As you know, a healthy classroom environment equals less sick days, higher test scores and happier students. 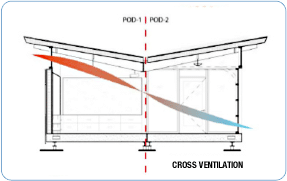 Built from low-emitting materials, these classrooms meet the highest indoor air quality standards. The conscious selection of healthful materials, ample day lighting and increased ventilation have a real effect on teachers and students, especially in relation to asthma and respiratory issues. Students can also pay attention more easily in a SproutSpace. In turn, this increases the level of student performance and everyone’s comfort, mood and energy. Improve students’ performance, comfort, mood and energy. Think you may have a need for Sprout Space? FIll out our brief form and we will get back to you.